A pair of these beautifully lightweight nail scissors is all you'll ever need to ensure your fingernails are looking their best no matter what happens and wherever you are at the time. Made from nickel plated steel, these nail scissors have a slim-line elegant finish and are compact for convenience. Everyday life can be hard on your hands and nails come into contact with all sorts of surfaces and materials, often leading to chipped or broken nails that are unsightly. If you care how your fingernails look, a good pair of scissors is a must! Some compact nail scissors can be fiddly, but not these ones, thanks to the generously sized and shaped handles; so whether you have above average size fingers or small hands, you'll find these nail scissors a joy to use. Comfort is only half the story, however, as the sharp, precision crafted blades are what makes this pair of scissors so unique. Curved for the perfect cut every time, you'll never need to put up with a broken nail for long and can snip away any ragged edges in seconds. 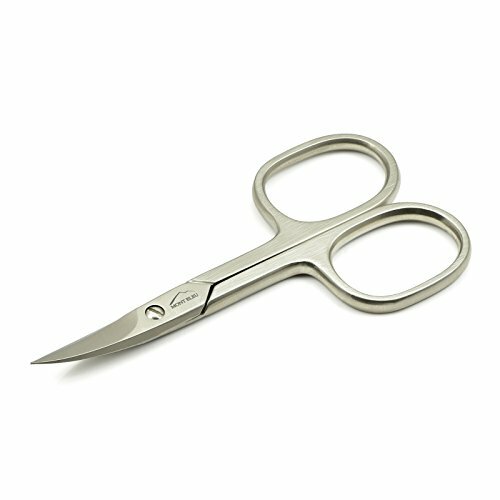 Great for personal use, these scissors are also perfect for the gentle care of delicate or strong fingernails such as those of yours, or for giving an elderly relative a special manicure. Manufactured in Italy to the highest standards and sharpened to perfection in Solingen, Germany, every pair of Mont Bleu scissors is built from durable nickel plated steel and designed to last a lifetime. Measuring only 9 cm (3.55” inches) in length and lightweight, these nail scissors are compact so you need never be without a pair, for use at home or popping in your bag when you're on the move. With their superb qualities, you always be able to keep your nails in perfect trim! If you have any questions about this product by Mont Bleu, contact us by completing and submitting the form below. If you are looking for a specif part number, please include it with your message.